Look to this book for advice, techniques, and strategies to help people stay vigorous and healthy as they grow older. People are becoming increasingly knowledgeable about managing their health as they age. 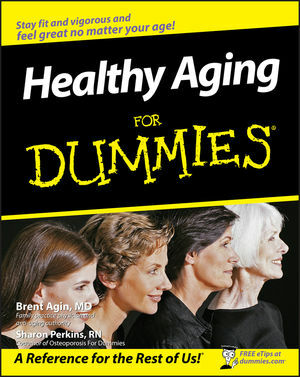 Healthy Aging For Dummies explains how people can embark on a healthy lifestyle that will enable them to feel young, both mentally and physically, even as they’re getting older. It covers tips and advice on choosing the ideal physician; starting an exercise program; learning to meditate; taking the right vitamins and herbs; dealing with or preventing heart disease, cancer, and dementia; replacing negative thinking with positive thinking; and building memory and learning skills. Brent Agin, MD, is a family physician in private practice and is also the medical director of a successful weight-loss clinic and laser medical spa. Sharon Perkins, RN, has coauthored five For Dummies books on women's health issues. Part I: So You Want to Look and Feel Young Forever. Chapter 1: The Fountain of Youth, at Your Fingertips. Chapter 2: The Four Major Health Concerns about Aging (and How to Prevent Them). Chapter 3: Evaluating Your Health and History and Setting Goals for Wellness. Part II: Workin’ on Your Framework. Chapter 4: Putting Your Best Face Forward. Chapter 5: Loving the Skin You’re In. Chapter 6: Building Bones and Preserving Joints. Part III: Using Nutrition to Extend Your Expiration Date. Chapter 7: You Are What You Eat: Nutrition 101. Chapter 8: Supplementing Your Daily Diet. Chapter 9: Maintaining a Healthy Weight and Fitness Level. Chapter 10: Strengthening Your Heart. Chapter 11: Building and Fine-Tuning Healthy Muscles. Part V: Sharpening the All-Important Mind and Spirit. Chapter 12: Keeping Your Mind and Memory in Tip-Top Shape. Chapter 13: Decreasing Stress to Live a Longer, Better Life. Chapter 14: ZZZ . . . The Infinite Importance of a Good Night’s Sleep. Chapter 15: Don’t Worry, Be Happy: The Keys to Maintaining Health and Vitality. Chapter 16: Ten Medical Myths that Can Affect Your Health. Chapter 17: Ten Foods to Help You Age Healthfully. Chapter 18: Ten Mind Games to Boost Your Brainpower. Chapter 19: Ten Ways to Make Your Home Safer as You Age. Appendix: Health, Lifestyle, and History Self-Assessment.